ATV Parts, ATV Radiator Kits, ATV Wheels Tires, ATV Suspension Springs Shocks Bumpers - Wild Boar ATV Parts > Radiator Relocation Kit > Kawasaki Brute Force 2012-up 650i/750i Radiator Relocation Kit Buck Face Plate $189.00 FREE SHIPPING! « Kawasaki Brute Force 2012-up 650i/750i Radiator Relocation Kit Stars and Bars Plate $189.00 FREE SHIPPING! 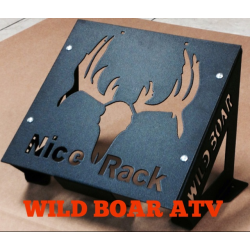 Check out this Wild Boar “NICE RACK” Radiator Relocation Kit! ON SALE NOW for $189.00 includes FREE SHIPPING! Includes everything you need to install to get you out on the trails!